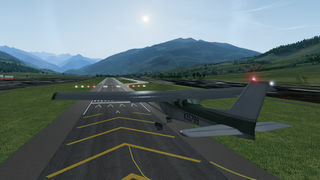 Note This is the default FlightGear aircraft and is distributed as part of the base package. 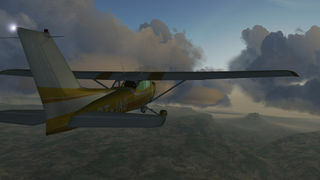 The Cessna 172P Skyhawk is a four-seat, single-engine, high-wing fixed-wing aircraft. First flown in 1955 and still in production, more Cessna 172s have been built than any other aircraft. 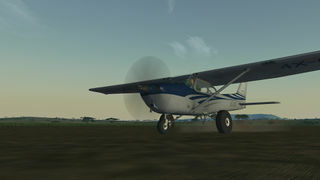 The Cessna 172 has been the default aircraft in FlightGear since 2000, when it replaced the Navion. It has had a long development and includes a wide variety of simulation features. In 2015, it went through a complete refresh, including engine options, various tire sizes and floats, as well as a complete cockpit texture makeover. 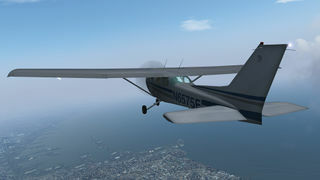 This new detailed version of the plane has become the default aircraft since FlightGear 3.6. 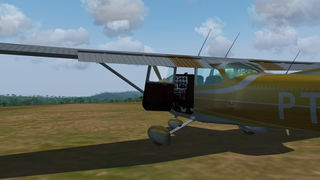 The new C172p has a much better 3D model and is now fully textured (including the interior). All the switches in the cockpit are clickable. It also has an improved FDM (Flight Dynamics Model - the "physics" of the plane), more complex procedures and new realistic checklists, new sound effects, and damage modelling. The aircraft can get damaged if mishandled (e.g. gear collapse after a hard landing). The aircraft now can get damaged from collisions, crashes, hard landings or overload while in-flight, and the modelling includes wheel collapse, wings breaking, etc. 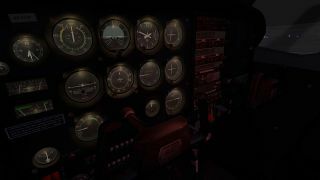 The damage can be turned off in the aircraft menu, which also contains an option for repairing the aircraft. The windows now can get foggy or frosty, depending on the combination of interior and exterior temperatures. The pilot must then use the Cabin Heat and Cabin Air levers (on the right of the flaps) to control it. 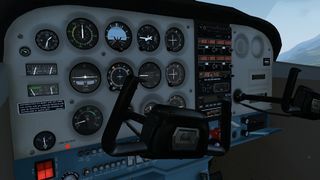 Alternatively, it's possible to disable the effect in the "Aircraft Options" in the "Cessna 172P" menu. This effect depends on the new ALS (Atmospheric Light Scattering) effects found in 3.5 and above, and will also have the side effect of producing grey windows in versions prior to 3.5. The FDM has also been modified. The aircraft may enter into a spin in case of an asymmetric stall (a particularly dangerous situation when turning to final, in which case the aircraft is at low speed and low height). The FDM has also been tweaked to include hydrodynamics effects while taking off or landing on water, as well as adding a new 180 HP engine. There are several liveries available, some of which have higher resolution than others, which are marked as HD in the liveries menu. Each of the HD liveries also has unique cockpit and interior textures. 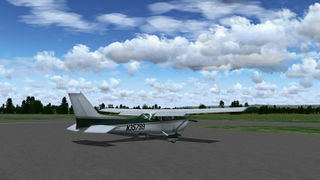 The aircraft has a simulation of the Bendix/King KAP140 Autopilot. 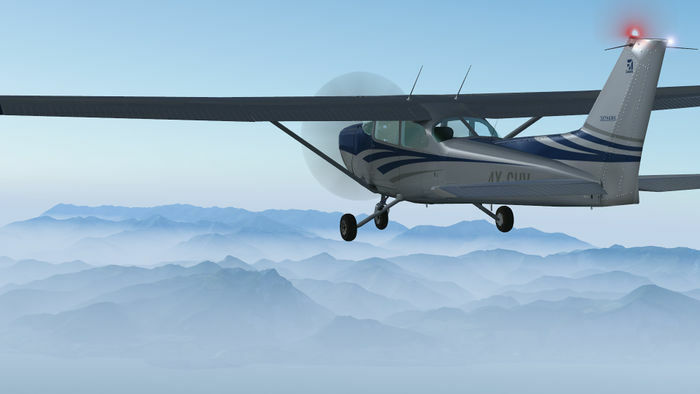 Also, if the user has enabled ALS (Atmospheric light scattering) in the Rendering Options, then it's possible to activate the flashlight by clicking on the "Cessna 172P" menu and selecting "Flashlight". Select it once for the white flashlight, select it again for a red one and select it one more time to turn it off. 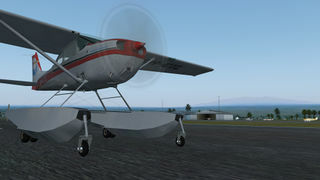 The aircraft can now go through a pre-flight: wheel chocks, tie-downs and the pitot tube cover can now be added or removed, oil management and fuel contamination by water have been implemented (both of which are not activated by default, but are available in the Aircraft Options dialogue). Carburettor icing is also modelled. Accumulating carburettor ice will result in loss of power. Applying carb heat will help to melt it. If the engine starts to cough when carb heat is applied, it means that ice has indeed been accumulated in the carburettor and now is being melted. To reduce a cough during the melting process, one can lean the mixture. As of version 2016.3, static objects can be toggled in the Ground Equipment dialogue. These include cones under the wings, a fuel truck, a ground power unit and ladders. The ground power can be used to recharge the battery and the fuel truck can be used to refuelling the tanks. The walker can climb the ladder by walking towards it, which makes it easy to access the fuel tank cap in order to refill it. It's recommended to use any exterior view or activate the walker for these procedures. Nose: check for oil quantity by clicking on the oil door in the nose. Critical oil level for either engine is 5.0 quarts. 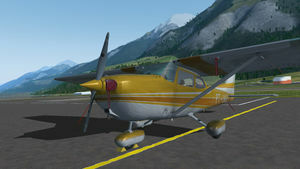 Click on the menu "Cessna C172P" and select "Autostart" in order to start the plane. Please note that the Autostart attempts to start the engine with the mixture full rich, so if you are taking off from a very high altitude airport you may need to manually start the plane. The information in this section is based on external resources. Q: I am experiencing grey windows, what is happening? A: If you are experiencing grey windows, you do not have the minimum FlightGear version to run this aircraft. Consider upgrading your Flight Gear version. Q: Why does the aircraft keep turning left? A: Please see understanding Propeller Torque and P-Factor. If using the amphibian model on a solid runway, note that at the taxiing is done by differential braking (the rudder becomes more and more effective as the plane gains speed). Q: Why will the engine not start? A: You can start the engine automatically by clicking on the menu "Cessna C172P" and selecting "Autostart". For a manual start, please follow the checklists available by clicking on the menu "Help" followed by "Aircraft Checklists". As seen above, the engine must by "primed" before starting. If oil management is activated, you must have enough oil for the engine to work (more than 5.0 quarts). If fuel contamination is activated, the fuel must be light blue in order for the engine to properly work. You must also make sure that the battery is charged enough (you can check and recharge it in the Aircraft Options dialog). Or it might be as simple as not having the magneto[s] turned on (which provide electricity to the spark plugs), or the fuel mix is too lean (put it at 100% to start) or the throttle too low (put it about 10-20%). Q: Why does the Autostart fail to start the engine? A: That's probably because you are attempting to take off from a very high altitude airport. Autostart always tries to start the engine with the mixture full rich, and if it fails to do that properly then you must manually start the engine after properly leaning the mixture. Q: Why does the engine die immediately after startup? A: Probably because the throttle is being incremented too fast after startup as the engine needs a few seconds to stabilize itself. Q: Why can't I start the sim with the engine running? A: You can! Go to the menu "Cessna C172P", select "Aircraft Options" and tick the option "Start with engine running". Q: Why I keep running out of battery? A: Just like in the real airplane, it's always a bad idea to keep the battery switch on for a long time while the engine is not running, as the battery will run out of charge. When the engine is running, the alternator will make sure that the battery is always recharging. If you run out of battery charge, go to the Aircraft Options dialog and recharge it. Q: Why doesn't the aircraft move? A: The aircraft won't move if you have the parking brakes set, or if either of the wing tie-downs, the tail tie-down or wheel chocks are in place (if the option "allow securing aircraft" is enabled in the aircraft menu). Q: Why the airspeed indicator doesn't work? A: If the option "allow securing aircraft" is enabled in the aircraft menu, then very likely you forgot to remove the pitot tube cover. Q: How can I switch to the bush tires/pontoons/amphibian? 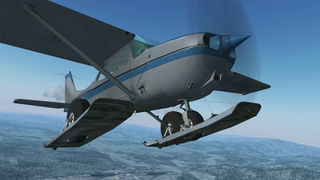 A: By clicking in menu "Cessna 172P", selecting "Aircraft Options" and then selecting the other landing gear options. Q: How can I switch to the 180 HP engine? A: This is also done by clicking in menu "Cessna 172P", selecting "Aircraft Options" and then selecting the engine power option. 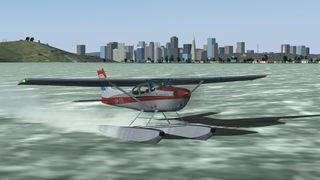 Q: Why can't I take off from the water without crashing the plane? 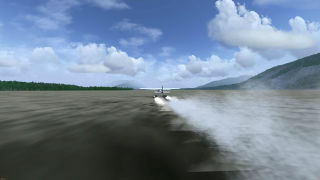 A: Taking off and landing on water can be quite tricky. Try applying a little bit of back pressure on the yoke while accelerating to 55 KIAS. It's also recommended to use the 180 HP engine instead of the default 160 HP, as the extra weight of the pontoons make it really hard to climb with the default engine. Q: Why is the simulator lagging so much? A: As with any complex 3D model, this new version of the c172p is a bit more demanding on the computers than the older one. If you are having troubles with performance, try using non-HD liveries which use textures with lower resolutions, as well as other solutions that can improve performance (disabling certain graphical options in the Rendering Options, lowering the resolution of FlightGear, etc.). Some tricks that help to increase fps is by disabling all GUI windows, including the menu bar and the orange fps counters at the bottom of the screen. You can display an alternative fps counter in the top left corner via the "Debug" menu and then selecting "Cycle On-Screen Statistics". Make sure to hide the menu bar by pressing F10 to see the counter. A second trick is to simply disable the rendering of all clouds if you don't mind. 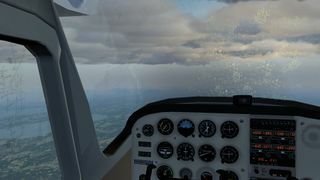 Start FlightGear with "--prop:/sim/rendering/draw-mask/clouds=0". If you notice heavy slowdowns when flying over certain scenery and you see FlightGear generating many "Warning:: Picked up error in TriangleIntersect" messages in the terminal or log file, you can disable this by starting FlightGear with "--prop:/sim/rendering/osg-notify-level=fatal". Q: Why are the windows getting foggy/frosty? A: If the dew point of the cabin air temperature is higher than the surface temperature of the windshield, the windows will get either foggy or frosty. Use the Cabin Heat and Cabin Air levers (on the right of the flaps) to control it. The dew point rises with the temperature in the cabin, and it rises faster than the windshield temperature can adjust, resulting in temporary fog. If the air is very humid, the dew point is going to be very close to the cabin temperature, which makes it likely that it will be higher than the windshield temperature. Extra passengers will create a more humid atmosphere in the cabin. Try to increase air flow using the Cabin Air lever or overhead air vents in order to decrease the humidity or temperature. 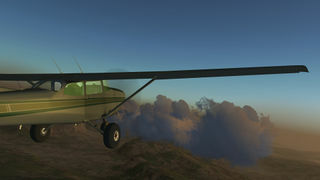 Alternatively, disable the effect by going to the menu "Cessna 172P", selecting "Aircraft Options" and disable the option "Enable frost and fog". Q: How do I increase the cabin air temperature? A: Increase the cabin air temperature by opening the Cabin Heat lever. In order to actually get a heated air flow, you need a medium or high EGT (Exhaust Gas Temperature -- the instrument between the yoke and the ADF instrument), and airspeed and/or sufficient propeller RPM. Q: How can I click on a switch which is being covered by the yoke? A: You can hide the yokes by clicking on them or by going to the menu "Cessna 172P", selecting "Hide/Show Yokes". Q: Why my engine seems to be losing power? A: Assuming that you have the mixture correctly leaned according to your altitude and atmospheric pressure, then another possibility is that you are accumulating carburettor ice which results in loss of power. Apply carb heat and the ice should slowly melt. Notice that if the engine starts to cough when you apply carb heat, it means that ice is being melt and is a sign that icing was indeed your problem. To reduce the cough during the melting process, lean the mixture. This aircraft is undergoing a constant development, which can be followed on its repository, where a list of issues and future enhancements can also be found. ↑ Type Certificate No. 3A12, Revision 79 (pdf). Published by FAA. Retrieved 9 October 2015. This page was last modified on 5 February 2019, at 23:57.